Jessi Edwards resides in Winchester VA with her husband, Brandon, three children and her oldest daughters service dog. She is a 300 hour yoga instructor, a professional artist/art instructor, co-owner of a local women’s tackle football team and has over 30 years of experience in the pageant industry as a contestant, parent, judge and director. Jessi founded Miss Abilities Organization after being inspired by her oldest daughters wish to be the first Miss America with autism! Born and raised in Winchester, Sara Maphis lives with her husband David and their five children. She is an employee at Winchester Eye Specialists. In her spare time spending time with her friends and family. When her son received an autism diagnosis, she began looking for ways to help, get support and give back to the community and felt Miss Abilities was the perfect way to do that! Jessica Goodwin currently resides in Winchester VA with her husband Aaron, two daughters and 9 pets. She is a 5th grade math teacher for Shenandoah County Public Schools and tutors on the side. She enjoys spending time with her children and maintaining her family’s cabin on the mountain. 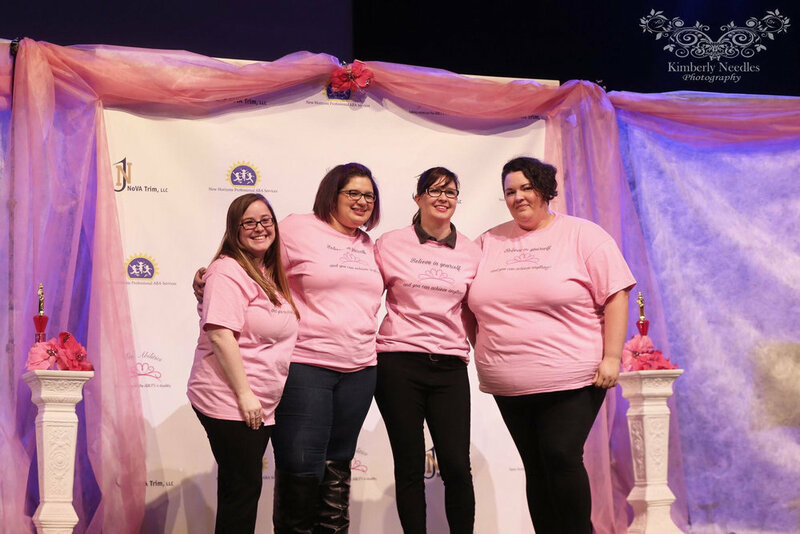 After volunteering for Miss Abilities 2016, Jessica decided that she wanted to play a more active role with the organization and is now Treasurer and Sponsors Coordinator! Amanda Whitson lives in Stephens City with her husband Bill, boxer pup and long term foster dog and is the director of property management for Coldwell Banker. Through work, she helps organize benefit fundraisers for local organizations like The Evans Home. Amanda decided to focus most of her volunteer efforts in the special needs community when her nephew was diagnosed with Downs Syndrome. After two years of volunteering with Miss Abilities Organization, Amanda is very much looking forward to taking on a larger role this year as the Volunteer Coordinator. Leslie Sadler resides in Front Royal, Virginia with her husband, Shawn, dogs and cat! She has 20+ years of experience in the world of pageantry and community service. Leslie graduated from James Madison University with a Master’s in Special Education and teaches in Prince William County. She has volunteered for Miss Abilities as a Buddy since 2016 and in 2018, was added to the Board of Directors to share her passion for empowering youth in the special education community. Hannah Shaw is a retired Registered Nurse with 30 years of experience in the special needs community. She holds a BS in Nursing from Murray State University and worked in neuro-psychiatry, brain injury rehab, pediatrics and home health care. She is the founder of dreamBIG Productions, offers pageant coaching for young girls and volunteers with Miracles in Motion Dance Group, which is a dance company for children and young adults with Special Needs.